"A full slate of entertainment and activities is planned for this year's Pyjama-Rama including musical entertainment by Sing House Studios, princesses from Glass Slipper Princess Parties and superheroes from The League of Super Heroes. Activities include science experiments by the Nutty Scientists, Lego building with Bricks 4 Kidz, a petting zoo with The Zoo Crew, mini painting workshops with Pop Up Painters, Taekwon-Do demonstrations from Black Belt Excellence Martial Arts Academy, hockey skills challenge with Rink Eye Development Center and family fitness fun with My Gym Children’s Fitness Centre and Kanata Gymnosphere. Plus there will be face painting, glitter tattoos, crafts, mascots and more. Tickets are $15 per child and includes a pizza lunch and beverages. Those not wanting lunch can purchase a ticket at a reduced cost of $12 per child. Each paid ticket includes admission for one parent. Additional tickets for adults can be purchased for $5.00. Buy your tickets on-line at https://pyjamarama.eventbrite. ca, Limited tickets will be on sale at the door the day of the event. 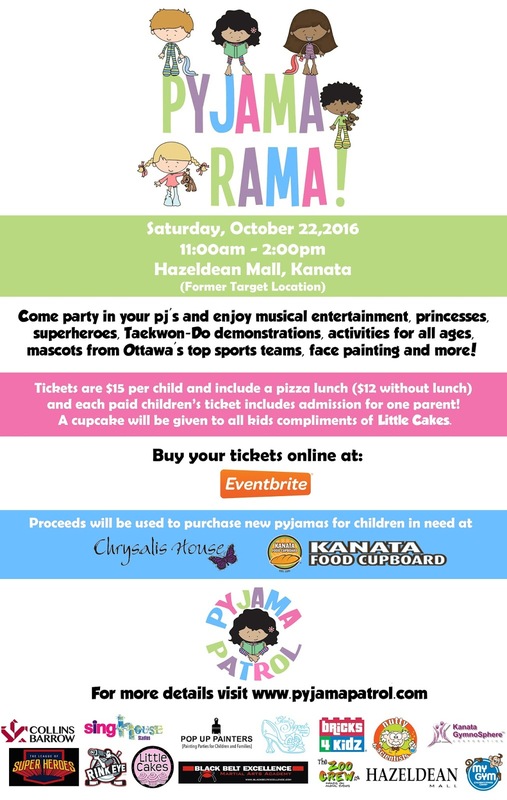 Proceeds will be used to purchase new pyjamas for kids in need at the Kanata Food Cupboard and Chrysalis House (a program through the Western Ottawa Community Resource Centre), a 25 bed shelter where woman and their children can go to protect themselves from violence and abuse. For more information about the Chrysalis House visit www.wocrc.ca/violence-against- women/chrysalis-house and to learn about the Kanata Food Cupboard go to www.kanatafoodcupboard.ca"